James Bond wears Orlebar Brown swimming shorts, or at least, Daniel Craig does in Skyfall. Now Orlebar Brown is cementing its relationship with the famous film franchise with these awesomely retro trunks, which feature graphics from four classic posters. Called the 007 Exclusive Series, these are a must for any James Bond fan. Orlebar Brown (OB) is based in London, and is famous for taking a more tailored approach to men's beach and swim shorts. The brand is built on the concept of "not so much a swim short but a short you can swim in", offering something you can wear on the beach, by the pool and then smart enough to go and have a drink or lunch. OB's Dr. No shorts feature the films iconic beach scene from the first Bond film. It's sure to inspire you to seek similar sunny adventures. The image featured on these Bulldog shorts was originally used for placement in cinema lobbies to promote the first James Bond film. These trunks use a still from Live And Let Die’s memorable chase scene – Bond using a Glastron GT150 speedboat to evade Dr. Kananga’s men. In spectacular fashion, the boat is captured mid-flight as it leaps over two cars. The film crew unintentionally set a world record when the boat cleared 110 feet. The scene was originally seen on lobby cards in the US. Featuring artwork depicting a stylised Bond piloting an autogyro called 'Little Nellie' while being pursued by Spectre helicopters, these trunks could be perfect if you're holidaying Japan (where most of the film is set). If you're worried that your own 'Little Nellie' really is a bit too much on the little side, the fact the design of this piece depicts an actual chopper firing actual rockets from your groin area will give a lot of comfort, as well as making you look effortlessly suave. In typical style, Bond appears cool, calm and collected – so much so that his hands aren’t even touching the steering wheel. These are T3's favourite design, featuring an illustration of Sean Connery as Bond beating off a Spectre agent. 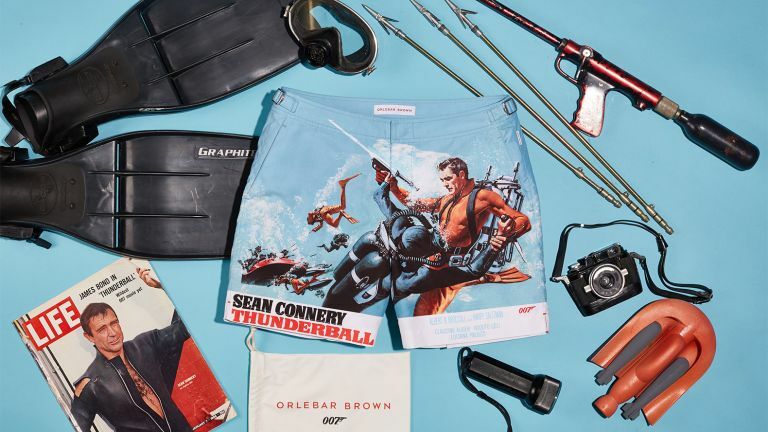 These underwater action scenes contributed to Thunderball winning an Oscar for Best Visual Effects, and make for a perfect pair of swim shorts for all 007 enthusiasts. All designs come in OB's original 'Bulldog' style, based on the pattern of a man’s traditional tailored trouser with signature side-fasteners to adjust, and crafted from fabric that dries quickly. They're priced at £245, and come with a five-year guarantee. Check out all the designs on Orlebar Brown's website.